Everything we’ve learned throughout our lives we owe to our mothers. From day one she is your best teacher, therapist, caregiver and friend. While one day a year is certainly not enough to celebrate all that she does, Mother’s Day is a day to treat her! You may ask, “what exactly do you do get for the woman who has done, and will continue to do, everything for me?” Not to worry, we have compiled a list of ten special things to do, and get, for your mom this Mother’s Day! The spring flowers are in bloom, with so many beautiful colours and scents to take in! This is a great place for a leisurely stroll, taking in the stunning sights, and even enjoying a little picnic with mom. Botanical gardens often have various events going on as well, and may even have something special planned to celebrate Mother’s Day. If your mom enjoys shows and the arts, taking her to see a show at your local performing arts centre may be just the perfect thing. Every venue has a variety of performances, from bands to plays. Take a look at their schedule, and surprise her with a special evening at the theatre. Pamper Mom with a spa day… at home! Turn your living room into an at-home spa experience for mom this Mother’s Day! Set up a station for a foot soak, paint each other’s nails, and chat about her favourite things. Go the extra mile and try out a face mask, complete with cucumber slices for your eyes! You can even put on some of her favourite music to enjoy together. Make a refreshing pitcher of cucumber water, or better yet, add a glass of champagne for a truly decadent experience. Have everyone dress up in their Sunday best for an afternoon tea party. This is a great excuse for you and Mom to don fabulous hats. You can serve a variety of different teas in dainty teacups, along with finger sandwiches and assorted pastries. Fresh flowers are the perfect finishing touch for your table. And if the weather is nice, you can even take it outside to enjoy the beautiful spring weather. Take a trip down memory lane, and create a personalized memory book for your mom. You can create a digital book online that can be printed in a professional format, or go old-school scrapbook style. Include photos from her childhood, grandkids, friends and family, or even little stories from her past! She will love flipping through the pages and seeing all the amazing memories of her loved ones. Every mom has a guilty pleasure; why not put together a gift basket of some of her favourites! Grab a nice basket, and package up some of her favourite candies, chocolates, or even baked goods for her to enjoy as she pleases. She’ll be sure to love the personal touch of this thoughtful gift. Flowers are beautiful, although they don’t last as long as we would like them to. Skip the bouquet this year, and opt for a stunning succulent arrangement. These unique plants can be arranged into various planters to suit her taste, and are low maintenance. This arrangement will also last her far longer than the traditional bouquet of flowers! Books are a great way for mom to take a break, and escape to a different world. Pick up a new page-turner for her to lose herself in. You can go old-school paperback, or splurge for an e-reader such as a Kindle or Kobo loaded with some classics as well as the hottest book club picks. Include a pair of plush new reading socks, or perhaps a robe to help her cozy up even more. 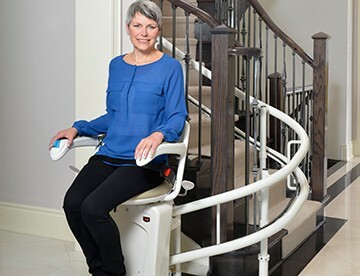 If your mom struggles with the stairs, a stairlift could be the ultimate gift for her! A great group gift, a stairlift can mean peace of mind for the whole family. Mom will be able to safely conquer the stairs, and find comfort in staying in the home she loves. There are various models available, so you’ll be sure to find one that fits her space. You can learn more about stairlifts here. We decided to go with SILVER CROSS because we thought the owner took a personal interest in our situation. We were right. You and your staff have truly given me confidence and gratitude in you and all you have done. Thank you for everything.